With the high price of gasoline taking an ever bigger bite out of our summer entertainment budgets, one does not have to travel far from home to enjoy a classic retro outdoor grilling excursion.Bringing back an outdoor cooking technique from the mid-century Patio Culture, foil cookery is an easy and cheap way to appease the Gods of Grilling Past and have fun closer to home. The premise is ridiculously simple. Pack complete and portable meals inside foil cooking pouches, load them into a cooler, take them anywhere you can build a fire, eat them, and clean up with minimal fuss. 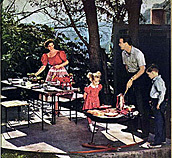 While the wonders of backyard cooking were well known to mid-century dads, I’m sure it was mid-century moms who first attempted to contain the resulting mess of charred meat remnants and grease with foil. Apparently successful, foil cookery soon became a common sight on patios all across America. Harkening back to my own Scouting days in the late 1960’s, this type of cookery was considered an intermediate step between regular camp cooking using pots and pans, and primitive cookery using sticks and coals. Leave it to the miracles of science and technology (and moms) to bridge the gap! To create a portable meal in a pouch you first need aluminum foil (duh). The next step, however, will vary depending upon what heat source you are planning to use. 1. Double wrap your meal in foil if you are going to be cooking directly on coals. This way you’ll get extra thermal protection from the higher heat. Remember, If you’re going to use an outdoor wood fire, be sure to let it burn down sufficiently to create a nice even bed of burning embers. 2. If you plan to put them on the grill several inches over the coals, you only need to wrap it once. Prepare the foil pouch per the instructions above. Spray the interior of the pouch (shiny side) with cooking spray. Layer the potatoes, carrots, seasoned meat patty, and onions in the center of the pouch. Season with salt and pepper then fold into a tightly sealed pouch (see illustration). Cook for about 15-20 minutes if you’re cooking directly over coals, or 30-45 minutes if you’re using the grate over your grill. Use your senses to help you determine when its done! When it’s ready, carefully take it off the fire, let cool for a minute, then cut open to form a foil “plate”. Be careful of the steam when you open these, and I suggest you put the foil on a real plate lest you have molten food introducing itself to your crotch! The hybrid meal shown above is an example of the diversity of this type of cookery. Note the squash and bell pepper along with the traditional beef patty, onion, and potatoes. Note: Steamed meat inherently lacks the flavor that only direct fire can impart, therefore it’s my opinion that you need to add something to help out the meat. Almost anything will do, but I suggest steak sauce, or dried soup mixes worked thoroughly into the meat. The preparation for this recipe is the same as above, except the sky is the limit! Almost any combination of meats and vegetables can be used to create a foil meal. Squash, bell pepper, sweet potato, ham, pineapple, you name it…It’s up to you! I’ll use the following as an example of a non-traditional foil meal. Prepare the foil pouch per the instructions above. Spray the interior of the pouch (shiny side) with cooking spray. Layer the fresh rosemary, chicken breast, mushrooms, bell pepper, and lemon in the pouch. Season with salt and pepper and fold to make a tightly sealed pouch. Cook for about 15-20 minutes if you’re cooking directly over coals, or 30-45 minutes if you’re using the grate over your grill. Remove and serve. Note that fresh rosemary tends to pack more of a wallop than its dried store bought cousins, so use accordingly. For an extra treat give your foil a quick dose of cooking spray and wrap up firm, fresh apples and bake over the coals for about 30 minutes. Bananas are good too and only take about 10 minutes. Once you’re an experienced foil chef you can try the ultimate tiki dessert…a whole pineapple! If your foil cooking adventure took you into the great outdoors, be sure to thoroughly douse your fire (I mean cold to the touch), and pack out your trash. Remember your aluminum foil (and “beverage” cans) are recyclable! You might could even recoup some of your gas expenses depending on your drinking habits!